11"Dia. x 4.5"T; holds 3 quarts. 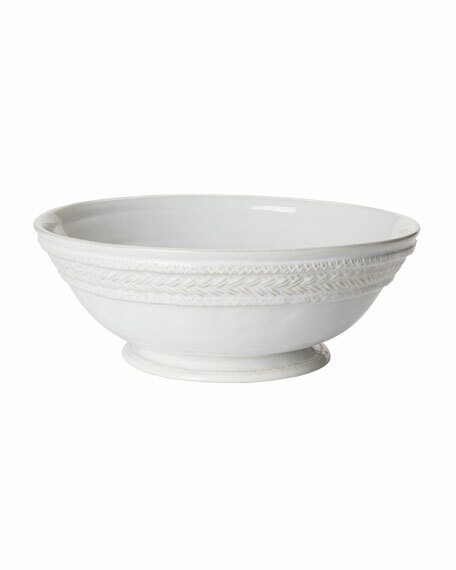 Pedestal bowls with key design. Crafted of glass. Set of four. Holds 10.82 ounces. 4.3"Dia. x 4.3"T. Hand wash. Imported. Handcrafted of ceramic with cast aluminum acanthus leaf base. 6"Dia. x 10.5"T. Hand wash. Imported. High fired porcelain fruit bowl. Real gold accents. 18"W x 8.5"D x 3.5"T. Dishwasher safe. Imported. Muse lidded sugar bowl. 3"Dia. x 5.5"T. Full-lipped on one side, mustachioed on the other. High-fired porcelain with sheer, high-gloss glaze. Dishwasher safe.